The range of cranes that can be supplied include both single and double girder overhead travelling cranes together with slewing jib cranes and underslung cranes incorporating special low-headroom trolley designs. Cranes with parallel hoists and synchronized lifting hoist arrangements can also be supplied, with individual hoist capacities up to 100 tons. J D Neuhaus specialize in the provision of crane systems adapted to suit individual requirements. This can include remote radio control of the crane lift and traverse operations, covering comprehensive application requirements and even simultaneous operation of multiple hoists. 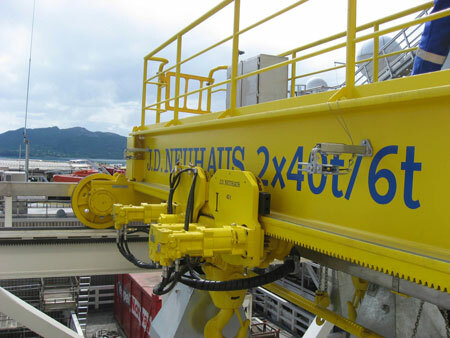 For lifting operations on offshore rigs or sea going vessels, crane systems can be fitted with rack and pinion drive systems to ensure safe operation during bad-weather conditions. Control boxes with receiver can also be customized to suit specific electro-hydraulic interface requirements, together with all necessary system tubing in stainless steel where required. All equipment is designed and rated for use in explosion-endangered areas. The standard rating is EX II 2 GD IIA/II 3 GD IIB T4 (X), with higher classifications also available on request. Super-silent operation is combined with sensitive, infinite controls including controlled load-lowering in the event of supply oil failure, together with an integrated overload switch-off function. Oil or HFC pressure fluids can be used at intake pressures of 100 to 180 bar. Only two supply connections are required per hoist with leakage oil drained internally for maximum safety.